When I moved into the office there was a decorative planter sitting in the window filled with nothing but a pile of dry, lifeless soil. Sometimes I’d look over at it, sitting there all lonely and mostly empty, and picture it filled with one of nature’s vibrantly-colored plant creations. 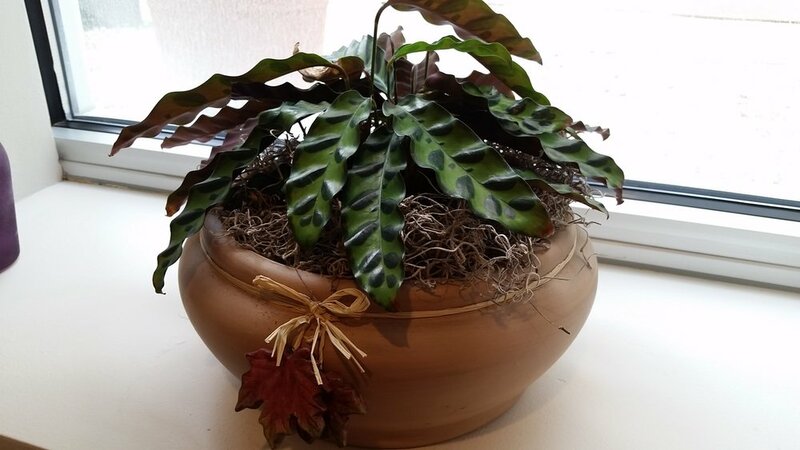 But, the fact that its emptiness did not seem to bother my office mate, who was there well before me, coupled with the awareness that my plant nurturing abilities, on a scale of 1 to 10, consistently proved to be about a 1.75, I decided to leave the planter as is. And then she moved out, leaving that lonely, mostly empty planter in the window. I’m not sure what came over me but I became determined to change the course of my plant care history from Black Thumb Sadness to Green Thumb Victory…starting with this one random planter! Like a nervous new parent wanting to make sure I made the best decisions for my child, I walked into the nursery, holding the planter as though it were my newborn baby, ready to ask tons of questions. Is there something that thrives in low light? What about this one? Can I make that work? I learned that this particular “planter” was good for decoration, not growing. I learned that I needed more and better soil. I learned that re-potting a plant can be traumatic and therefore must be done with care. And, most importantly, I learned that its all a process that sometimes take a little trial and error to “get it right”. After about an hour of conversation, thinking, searching and contemplating, I walked out the proud Momma of a Calathea Rattlesnake (a.k.a prayer plant) who now goes by the name Ava. We have all been there. You know, those moments in time where daydreams of endless possibility are interrupted by that voice in the back of our mind yelling out reminders of things gone wrong, mistakes made and disappointments felt. It is those walks down memory lane that keep us stuck, afraid to try just one more time, in one more way. In order to experience success, we have to choose to ignore those frenetic yells and instead focus on the whispers of love and hope offered by that still, small voice residing in our heart. When we do this, we open the door to possibility in a way that allows us to water the seeds of new information we need to create the success we desire. Are you ready to start watering possibility? Invite Curiosity to hang out with you. By definition, curiosity is our strong desire to learn or know something. When we invite curiosity to be a regular part of our lives, we open the door to finding the answers needed to turn disappointments into possibilities. Ask questions, lots of them, because it is in our learning and knowing that we blossom as individuals. You gotta show up…for yourself! We often expect things from others. Love me. Take care of me. Listen to me. Respect me. But guess what, if we are not doing those things for ourselves FIRST, we cannot expect to receive the same from others. Are YOU honoring your dreams? Are YOU speaking to yourself with love? When we take care of ourselves, we are establishing fertile ground for deep, lasting growth. Take a celebratory walk down Memory Lane. When was the last time you spent time thinking about all the good you accomplished in one week, one day or even one hour? In order to experience the success we desire, sometimes we have to take a minute (or 60) to remember the good we do in our lives and then celebrate the heck out of those accomplishments. Celebrating our accomplishments, even the (seemingly) small ones, helps motivate our brain to create more celebration worthy goodness! Be in the here and now. We watch our calendars and check our clocks incessantly, ready to move onto the next thing. But, when we give ourselves permission to be in the here and now, embracing the possibility for effortless-ness, we create a space of ease that allows growth to flow to and through us. Create Accountability. Accountability is something we all need. Check your tribe. Who around you can help you stay on top of watering YOUR possibility? And sometimes we need someone outside of our tribe to help us get started. Let me know how I can help you!